ZAFOD nominated Pick n’ Pay in Zambia as a private sector entity that has demonstrated disability inclusiveness or mainstreaming in their respective countries, as part of the Disability Champions Award presented at the Gala Dinner held on 23rd June 2017 organized by Southern Africa Federation of the Disabled (SAFOD). 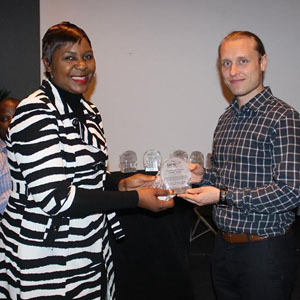 The Southern Africa Disability Champions Awards also honoured disability activists for their outstanding contributions over the past 30 years in each of the ten countries where it currently operates, namely Angola, Botswana, Lesotho, Malawi. Mozambique, Namibia, South Africa, Swaziland, Zambia and Zimbabwe. The awards are part of SAFOD’s efforts to sustain activism and advocacy for the mainstreaming of disability within the SADC region, and formed a key agenda at the Southern Africa Disability Round Table Forum, held at the same venue, from 20th to 23rd June 2017, at Holiday Inn Airport, Johannesburg, South Africa. Noting that in most of these countries, there have been many other illustrious disability activists, therefore choosing only one per would not only be taxing but might also feel like omitting the great work that the others did or have done. In the spirit of recognizing such other work, SAFOD also created the “SAFOD Hall of Fame” that was part of activities during the Gala dinner.